Went to my favourite LGS yesterday. They generally have reloading supplies and components that they pick up from gun shops that have gone out of business, and mark them down at a good price. So, there's this cannister of Winchester 450 LS there. Never heard of it, but the label is marked for target shotshell loads, so I figure it's gotta be useable for handgun loads. Get it home and start my research. Double-base ball powder that came out in the early 60's and was available until the early 70's. Was replaced by 452AA in the 70's, which was eventually replaced by WST. Dug out my Speer #8 reloading manual from 1970, and there is load data for the .38 Special and .45 ACP, but nothing else. That's fine, as that's what I intend to use it for. The one thing I found strange was that the Speer #8 manual specified using magnum primers with it, even with the light .38 wadcutter loads. So, I have to surmise that it's a bit hard to light up. Any of you 'ol timers got any other info or favourite loads using it? Thanks in advance for your reply. Re: Okay, you 'ol timers. The use of mag primers can produce higher velocity but they are used for ignition purposes. Delayed ignition can be extremely dangerous. Ball powders can be harder to ignite. In a worse case scenario, the primer can cause the bullet to move into the forcing cone or barrel lands. At this point, the bullet becomes an obstruction instead of a projectile. If the delayed powder burn kicks in at this point, things get very ugly. There are so many powders on the market today. There is no way they can all be represented in the data tables. Some powders have been removed from the data tables simply to save space and not necessarily because they are no longer suitable. The fear of litigation is always a consideration no matter what the product is being sold. Changes have also been caused by much better testing equipment. USSR wrote: Who knows why they used the Magnum primer for the .38 Special load, maybe just to boost up the velocity. But, since they used a standard primer for the .45 ACP load, a Magnum primer is obviously not necessary. Perhaps it has something to do with the length of the cartridge, as the powder charge would be spread out more in a .38 Spec. cartridge than a 45ACP cartridge. A magnum primer may help with complete ignition. Just a wild guess, as I have seen claims of slightly increased velocity using magnum primers. The "older powder" discussion is interesting though, as I have older load data that shown numerous pistol loads that are no longer listed in newer data. It makes you wonder if the powders have actually changed over the years, or if the Attorneys have! You may be on to something with the length of the powder column. While, most double-base ball powder data uses magnum primers, W231 and WST don't. Since this powder seems to be similar to WST, perhaps the use of magnum primer is only needed with the slower Winchester ball powders? BEA wrote: There are so many powders on the market today. There is no way they can all be represented in the data tables. Some powders have been removed from the data tables simply to save space and not necessarily because they are no longer suitable. I was referring to load data for a particular powder. As an example, there used to be numerous Red Dot loads listed for 9mm and .40 S&W in older Hercules data. Now there is nothing for either cal. in the newer Aliant catalogs. Is it due to a change to the powder itself, or has the data been reduced due to liability concerns? Very true. And, to add one more observation to the mix, have older powders such as Red Dot been removed from some current load data to make room for some of the new powders that have come on the scene in recent years? That's why it pays to have old reloading manuals. Note that they list “target loads” for Many different powders in 45, 357 and 38 Spl. I did try the 38 Spl load of 3.5 unique and found it to be accurate. Thanks for that link, Wobbley. Added that .pdf to my list of load data. Red Dot is still a valid choice for 9mm and 45 auto. Those loads were removed to save space. This space saving method has been used for some of their other powder too. The loads listed as "target" are already low pressure and reducing them any further is not recommended. Wobbley wrote: I think the rationale for the mag um primers in the 38 has more to deal with the size of the primer. The small primer has a much smaller priming charge than the large primer. So the 45 with its large primer didn’t need magnums. But small primer 45s don't need Mag primers. I have loaded and shot a lot of them and can't tell a difference. the subtle message to you "youngsters" is to never throw away a loading manual.. you just never know when you might luck upon a cache of older powder and need load data.. I have kept everything from the 60s when I started loading. Even some P.O.Ackley books that are spiral bound manuals. I have some obsolete powders that still perform very well for a particular caliber.. My stash of H205 will last me forever. only thing I run in my 257 Roberts. 8 lb. Metal canister of Red Dot might last too. one thing I have done is to replace all the old paper Hodgdon cans with a thick plastic bottle used for Lab work.. too much chance for moisture to get through. 2. Pay attention to what "BEA" says. He knows a thing or two about pistol shooting, and gunpowder. When using this older data be cautioned that powder companies advised to use only CURRENT load data. Sometimes things change and powders are sometimes manufactured under different conditions. These factors can change powders in mysterious ways. Hodgdon found this out with International Clays. Loaded in pistols, International Clays didn’t react well even though it burns in shotguns like Green Dot which does fine in most handguns. I don't remember 450 LS, but I burnt a lot of WW452. I shot trap and .45, and it was good for both, a very clean powder. Downside was it only came in 10 pound cardboard kegs, while Red Dot, which I used before came in 15 pound cardboard kegs. At some point BE got a bit hotter than the original stuff. Still the oldest powder available today. I do not know when the small square metal cans starting being used but I believe it was in the 50's. They were discontinued in approx the late 60's or perhaps 1970 at which time they went to the paper cans with metal ends. These square metal cans had the push in lids, but the lids with a red silhouette of Hercules are the oldest ones. The Hercules silhouette lid was discontinued in approx 1965 at which time the lid went to only wording "U-Press-It". The original Bullseye, known as Bullseye #1, was perhaps a bit faster, but that was dropped in the very early 1900's. Bullseye #1 was a byproduct of another powder having been the screened out fines of that powder. When the demand for Bullseye #1 exceeded the amount being supplied by the screening process, then Hercules started specifically making Bullseye and it was known as Bullseye #2. The new Bullseye was no longer made up of fines but rather more consistent flakes, so the recommended charge wts did change somewhat. This continues to be the version of Bullseye we are using today. I plan on throwing this stuff away when it gets too old. When this old stuff is gone, you will have to start over with an available powder source. Might as well start now instead of later. You seem to be late to the party. When this old stuff is gone, I will have a nice knowledge base of what this particular powder was all about, and how it compares to the current WST powder. It has nothing to do with starting over with another powder, as I have plenty of current powders. 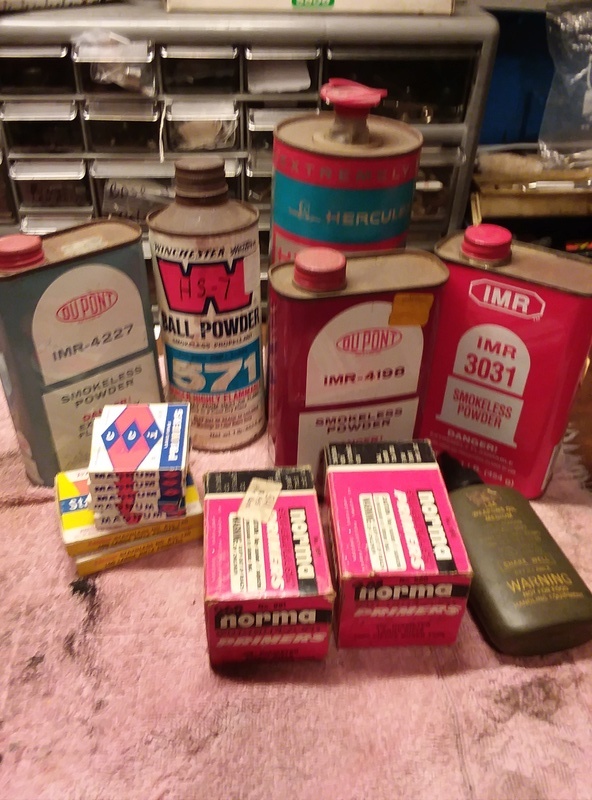 I am a NRA Certified Metallic Cartridge Reloading Instructor and a curious guy, and I treat reloading as an enjoyable hobby in and of itself, not simply as a means to be able to shoot in some form of competition.